Updated: Wednesday 9:45 a.m. | Posted: Tuesday 9:34 a.m. Looking to learn more about American civil rights leader Martin Luther King Jr.? Looking to remember his life and his work on this 50th anniversary of the day he was gunned down on a balcony outside his hotel room in Memphis, Tenn.? King, the eloquent American Baptist minister who moved a nation toward equality, was 39 when he was assassinated on April 4, 1968. Here's a roundup of events across Minnesota and links to more information to learn about the man and the movement. The Twin Ports community is invited to gather on Wednesday to remember and honor Dr. Martin Luther King Jr on the 50th anniversary of his death. Duluth Mayor Emily Larson and Duluth's Human Rights Officer Carl Crawford will feature opening remarks on the steps of City Hall facing Priley Drive from noon to 1 p.m.
A community conversation will be held Wednesday at YWCA Minneapolis Midtown from 5:30 p.m. to 6:30 p.m. The event asks participants to wear black as a sign of respect. Register for the event here. The Minnetonka Choral Society will host a concert entitled Lift Every Voice and Sing: Remembering Dr. Martin Luther King Jr. The concert will be held at Mount Calvary Lutheran Church in Excelsior, Minn., from 3 p.m. to 5:30 p.m. April 15. Tickets are $18 for adults, $10 for students. Half a century after his assassination, King remains one of the most vivid symbols of hope for racial unity in America. But that's not the way he was viewed in the last year of his life. The Million Man March of 1995 is recreated through the conversation between a young woman and her father, who attended it. He talks about how the event changed his life, and she recalls what it meant to see a poster of the march hanging on the wall of her father's den since she was a girl. Here's a timeline from Historically Black providing a scope of the civil rights struggle from the 1600s to the present day. Jan. 20, 1997: Ambassador Andrew Young says King "did everything he could to be an ordinary person but became a man of destiny." Jan. 15, 2001: In honor of Martin Luther King Day, U.S. Rep. Jesse Jackson Jr. offers reflections on King's "I Have A Dream" speech. Jan. 2, 2003: Voices of Minnesota: Chuck McDew is a founder and first chairman of the Student Non-Violent Coordinating Committee, or SNCC, and Willie Mae Wilson was one of thousands who marched with SNCC to end segregation in southern cities. May 18, 2010: Minnesota Public Radio's Stephen Smith interviews best-selling author Hampton Sides about his new book, "Hellhound on His Trail: The Stalking of Martin Luther King, Jr. and the International Hunt for His Assassin." Jan. 17, 2011: Families in the Hawthorne neighborhood of north Minneapolis got a chance to mark King's birthday in a 21st century fashion — with technology. Jan. 17, 2015: King made several visits to Minnesota during his lifetime. His last came in 1967, a year before he was assassinated. 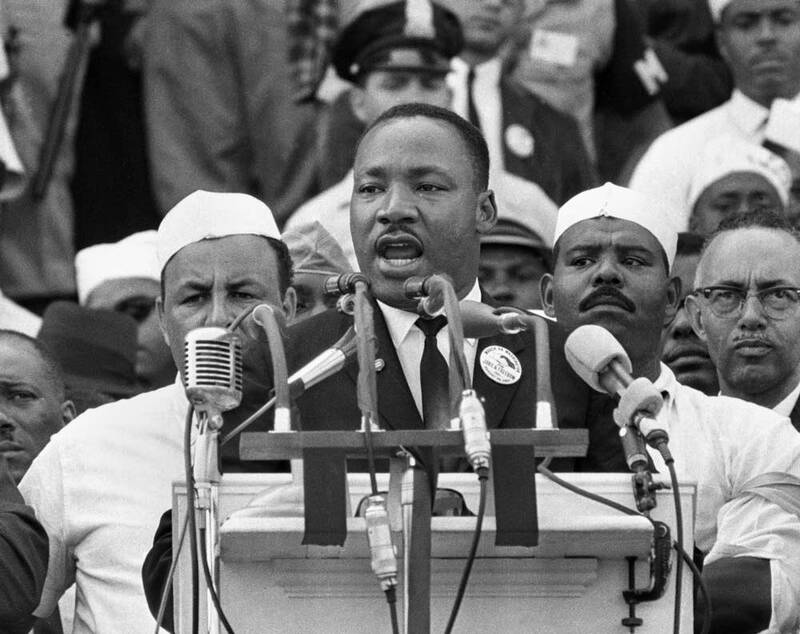 Aug. 27, 2015: 18 historic images from the 1963 March on Washington: The march featured King's iconic "I Have a Dream" speech in front of an estimated 250,000. This speech follows the date that Rosa Parks was arrested, the event that catalyzed the Montgomery Bus Boycott. And you know, my friends, there comes a time when people get tired of being trampled over by the iron feet of oppression. There comes a time, my friends, when people get tired of being plunged across the abyss of humiliation, where they experience the bleakness of nagging despair. There comes a time when people get tired of being pushed out of the glittering sunlight of life's July and left standing amid the piercing chill of an alpine November. There comes a time. We are here, we are here this evening because we're tired now. And I want to say that we are not here advocating violence. We have never done that. I want it to be known throughout Montgomery and throughout this nation that we are Christian people. We believe in the Christian religion. We believe in the teachings of Jesus. The only weapon that we have in our hands this evening is the weapon of protest. This speech, held at the Park-Sheraton Hotel to New York's Civil War Centennial Commission, speaks about the Preliminary Emancipation Proclamation. This speech, given in front of more than 250,000 people gathered at the Lincoln Memorial, asked that the citizens strive to set aside division and end racism. And so even though we face the difficulties of today and tomorrow, I still have a dream. It is a dream deeply rooted in the American dream. I have a dream that one day this nation will rise up and live out the true meaning of its creed: "We hold these truths to be self-evident, that all men are created equal. King's last speech before his death alluded to the threat of violence against his life before. Prior to the speech, King had almost lost his life from a stabbing in 1958, and days before his speech his flight to Memphis was delayed so security could check the plane for explosives. But his death the following day leaves some of his words to appear prophetic. Well, I don't know what will happen now; we've got some difficult days ahead. But it really doesn't matter to with me now, because I've been to the mountaintop. And I don't mind. Like anybody, I would like to live a long life-longevity has its place. But I'm not concerned about that now. I just want to do God's will. And He's allowed me to go up to the mountain. And I've looked over, and I've seen the Promised Land. I may not get there with you. But I want you to know tonight that we, as a people, will get to the Promised Land. And so I'm happy tonight; I'm not worried about anything; I'm not fearing any man. Mine eyes have seen the glory of the coming of the Lord. Correction (April 4, 2018): The original version of this story included an event from 2017. The article has been updated.